Born in Vienna, Waltz studied acting at the city’s Max Reinhardt Seminar before going on to enter the prestigious Lee Strasberg Theatre and Film Institute in New York. 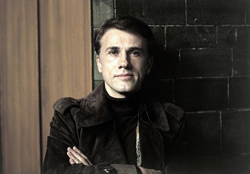 Beginning his career as a stage actor, working everywhere from Vienna’s Burgtheater and the Salzburg Festival, he eventually began to make his way into television and film. Gradually gaining a solid reputation in both Austria and Germany, along the way, Waltz found himself in the odd international production – notably a 1995 television film, Catherine The Great, which starred Catherine Zeta-Jones in the title role. 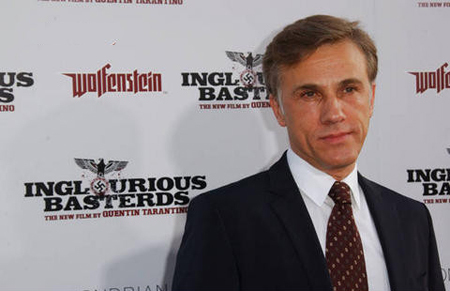 But inevitably, it’s taken someone with the vision of Tarantino to recognise Waltz’s undeniable talents and introduce them to the film-going public at large. As an Austrian, how do you feel about this as a treatment of WWII? I think one of the important aspects of the ‘thing’ – Quentin always says,’ Here’s the thing’ so I call it ‘the thing’. One of the important aspects of the thing is that cinema can do it. It’s an alternative. It’s not a correction of history. It’s an alternative. And it’s as real…especially for me. I was born in ’56, eleven years after the war ended. OK, I know from my parents and grandparents about the war. But if you look at it from a tangible point of view, the war being told to me – be it through the history books or my parents, or this movie – in terms of being tangible, they’re on the same level. Someone is telling something. I wasn’t there – thank god – but this is an alternative. Who claims that a movie pretends to only deal with the facts? We’ve had plenty of movies recently. They say, ‘This is how it was!’ Like Downfall. Well, sorry…it’s not. Does it bother you that it could’ve been your father in the Third Reich? No, it couldn’t! Don’t worry! But I know what you mean. Do you actually know how many convinced Nazis you actually talked to in real life. Of course not. You don’t know. Not perverse! Actually, one big part of the fun that I had – I keep talking about fun, sheer enjoyment, exuberance, exhilaration! – was that I kept myself from passing judgement. I didn’t say ‘Pervert, Nazi, villain, bad guy’ – and the movie never does that, and nor does the character. The movie does it once, at the very end. And you know how much fun you can have when you avoid judgement. It really is like warm wind under your wings. You can soar. Judgement is weight. Did Tarantino give you any movie references to work from? We had movie nights. Every Thursday night was movie night. You had beer, popcorn, hotdogs, nachos…the whole nasty, greasy stuff that you can buy in movie theatres. It was in Babelsberg – they have this fabulous movie theatre there. They’re equipped for everything. Quentin has a collection of 35mm prints, odd prints. He had them shipped over to screen them. Then he held these little introductory speeches which, as you can imagine, were fantastic performances. He showed two Hong Kong movies, and he was talking about the people who made them as if they were all cousins, and uncles – his family. The movies…some of them I knew, some of them I didn’t. But for me, it was these little introductory performance acts that hooked me. Did he show the film The Inglorious Bastards, from which he liberated the title? That he didn’t. Maybe he doesn’t have a print of it. Are you now expecting many Hollywood offers? You live in London now? Partly in London, partly in Berlin. So what is your background? Did you go to drama school? Tarantino has a good eye for casting... and who wouldn't want to work with him?! 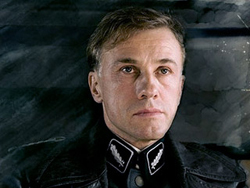 Christoph points out many of the flaws in 'Hollywood' without mentioning them directly (although it will be interesting to see his performance in The Green Hornet). I know a lot of my friends didn't enjoy IB as much as I did, probably because they were hung up on the history of the war too much. As he says in the interview, it helps to remember that the movie is not pretending to portray fact, just an alternative. Inglorious Basterds was a very entertaining movie. His performance was one of the most memorable ones form the movie. Lets hope he can find more roles he suits so naturally. Mate he was a mental character!, mean ending though got to love Quentins sense of humour. I love the way that Waltz responds in this interview - he comes across as very honest and straighforward, and he seems like a very good-natured, laid-back, grounded guy. I have yet to see Inglorious Basterds, but from what I can tell, it will be a very intense movie, that, although not straight fact, will likely be built up from truths already told. You can't expect any movie today to speak only of fact - that is the nature of movies - directors and writers can add or subtract or manipulate as they see fit. I also like the way he speaks of Hollywood, for of course you can't label it or EXPECT anything from it. Also, it's Hollywood - not everything that comes from it is good. Hell, some things are not even REMOTELY good. That's just Hollywood - that's just the way it is and the way it will always be. This guy was goooood. A little too good. In fact, he was so convincing, if I saw him walking down the street, I'd probably run the other way. Was he acting? God I hope so. Otherwise, we should all be very afraid! Looks a great movie to see.